If you like to travel in style, then COMO Parrot Cay’s Island Beach Villas will make your vacation dreams come true. Experience the seamless service of Parrot Cay, the region’s best cuisine, and the award-winning COMO Shambhala Retreat while you stay in Parrot Cay’s newest 3-bedroom villa. With a private infinity-edged swimming pool, this spacious villa features direct beach access and includes breakfast and butler service. COMO Parrot Cay offers two Island Beach Villas, each set in an acre and a half of their own land. With full butler service, daily breakfast, and COMO Parrot Cay’s resort amenities, these villas are ideal for any traveler who expects luxury. 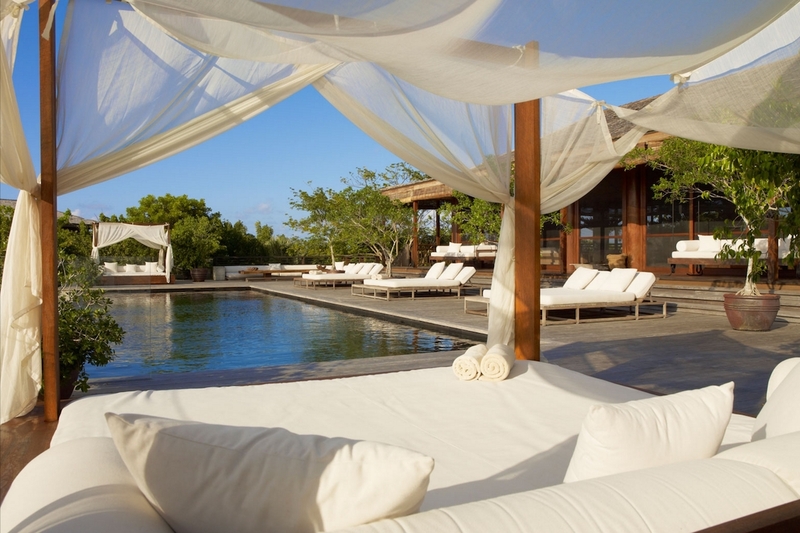 The Island Beach Villas were designed by Cheong Yew Kuan and are located on Parrot Cay’s sunset-facing shore. The private infinity pool sits in the middle of a large sundeck with canopied day beds, loungers, and sectionals. Tiki torches light the way to the beach just beyond, where white sand and turquoise waters await. Sliding glass doors lead into the living room and generous dining area, warmed by constant sunshine streaming in through the oversized windows. Whitewash ceilings, teak and oak finishes, and Caicos stone decorate the space, and a flatscreen TV with a DVD player provides indoor entertainment. A large wooden table for 8 sits in the dining room, and the fully-equipped kitchen sits opposite. There’s a utility room, study, and powder room around the living area as well. Two massive bedrooms sit on either side of the living room, and the third bedroom sits near the villa’s entrance. The dual master bedrooms each have ensuite bathrooms with freestanding tubs, outdoor showers, and teak decking with daybeds. King-sized beds and small living areas in the suites open to the veranda. The third bedroom has two twin beds and an ensuite bathroom with a walk-in shower, as well as garden views. All three bedrooms have flatscreen TVs and access to the central common space. COMO Parrot Cay’s guest services are comprehensive, with a 24-hour onsite manager, boutiques, babysitting, laundry service, and a public library. Onsite, guests can take part in yoga and pilates classes, sailing, windsurfing, kayaking, paddle boards, tennis, and waterskiing. There are excursions to Iguana Island and Sand Dollar Beach, snorkeling trips, and boat trips for all sorts of occasions and parties. Parrot Cay has two restaurants and two bars, as well as a fitness center with a spa.